Save AED 30 (76.92%) – Earn 1 Shukran What is Shukran? Shukran is the Landmark Group’s award-winning loyalty programme in the Middle East, which allows you to earn Shukrans when you shop any of our brands. 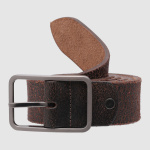 Add style to your personality by teaming this belt with any outfit of your choice. With a subtle texture all over, this belt looks striking and is fashioned with a pin buckle closure to bestow a desirable fit.